CarbonTracker-Lagrange (CT-L) is a new regional inverse modeling framework currently under development and designed for estimating North American greenhouse gas emissions and uptake fluxes. CT-L uses surface sensitivity footprints from Lagrangian Particle Dispersion Models driven by high-resolution meteorological simulations. Surface fluxes are optimized for a consistency with a variety of in situ and remote sensing observations of CO2 using Bayesian and geostatistical inverse modeling techniques. A beta footprint product is available for download now, and more products are coming soon. CT-L uses a high-resolution WRF-STILT atmospheric transport model customized for Lagrangian simulations (Nehrkorn et al., Meteorol. Atmos. Phys., 107, 2010). Species independent 10-day surface footprints are computed and stored for each measurement along with back-trajectories. WRF domains used for CT-L footprint generation. Meteorological fields are currently available for 2004-2010. 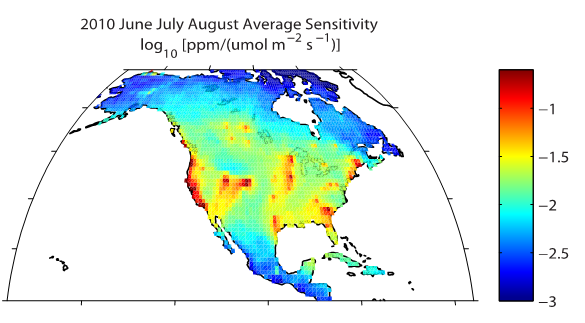 Sensitivity to surface emissions and uptake fluxes for summer 2010 representing the combined footprints for continuous in situ and discrete (flask) CO2 measurements that are linked to the WMO CO2 calibration scale. CT-L uses an efficient inverse modeling framework described by Yadav and Michalak [Geoscientific Model Development, 6, 583-590, 2013] implemented at NOAA in python and modified to include boundary value optimization similar to the method of Lauvaux et al. [Atmospheric Chemistry and Physics, 12(1), 337-354, 2012]. The fast sparse-matrix algorithms enable ensembles of calculations to test sensitivity to data-weighting scenarios, mathematical construct(form of state vector; Bayesian versus geostatistical optimization), and prior information. 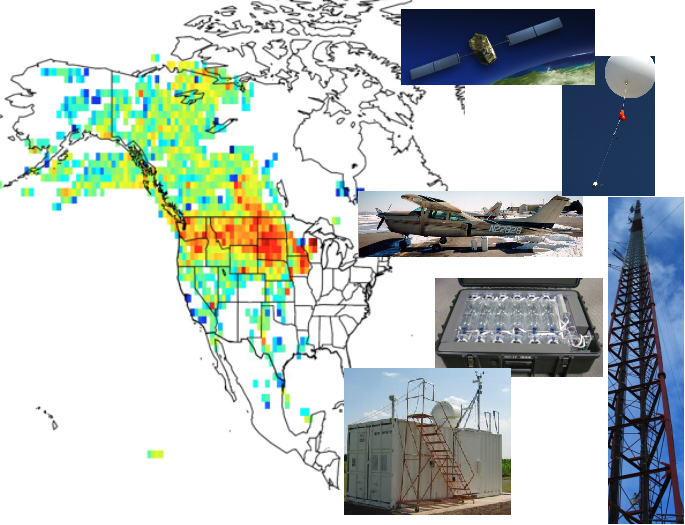 Support for CT-L has been provided by the NOAA Climate Program Office’s Atmospheric Chemistry, Carbon Cycle, & Climate (AC4) Program and the NASA Carbon Monitoring System.